Why You Should Choose This Mitcham Log Cabin Garage for Your Car. This delightful Trentan Mitcham log cabin garage is a delightful looking building and will protect your valuable car as well as looking good. The extra wide and tall garage doors will make it easy to get into the garage whenever you need and are ideal for many uses. This log cabin garage is extremely versatile and will fulfil a myriad of different uses to suit your needs. Being designed to fit into most homes it will help you to enjoy your home, help you to appreciate how good outdoors really is and protect your car from the elements. A sure sign of well thought out design. Also felt tiles, in choice of colours, are included FREE. Renowned and loved by the Swedes slow growing Nordic timber is one of the secrets of these garage log cabins. This cold part of the world gives this timber its great strength due to its slow-growing properties. And the Mitcham is solidly constructed using this timber ensuring a very long life for your new log cabin style garage. This timber is a natural fit with its good design ensuring it will be an asset to your home. Delightful sturdy doors add to its great and stylish appearance. And should be your first choice for your well-loved car. The Materials Used Are Key to A Quality Log Cabin. 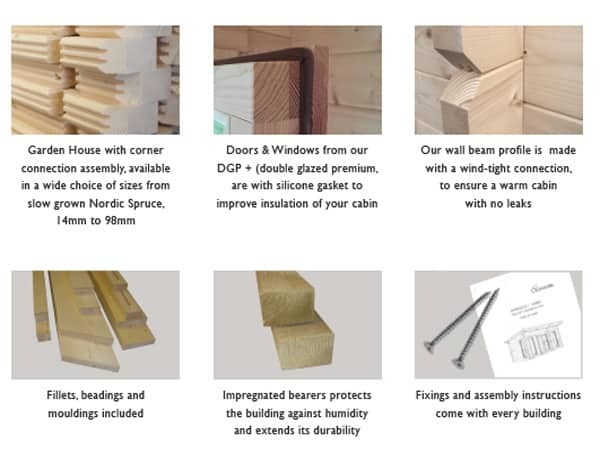 Being constructed from solid Nordic timber ensures the right quality. If you are trying to save a few pounds by using chipboard, OSB board or other similar cheap sheet materials then you won’t find them in these cabins. Cheap log cabin companies using these type of materials may save you a few hundred pounds, which seems like a great deal. However, it’s never a good idea in the long run. After only a few years these cheap materials will start to let you down and then you will realise QUALITY should always come FIRST. On these Mitcham garages, you will see that the quality aspect flows through from the Nordic timber right through to the double doors. Naturally, timber is kiln dried only comes from sustainable sources. The clever design of these Mitcham log cabin style garage ensures that they are straightforward to erect and come with detailed assembly guidelines. And many people will relish building their own cabins. But many are happy to let the experts take the load. In this case, we have dedicated third-party assembly teams who can do this for you. By utilising these teams your new cabin will be assembled in no time and all you have to worry about is how to enjoy your new garage. Your car will love you for it. And that must sound good to most. There are many companies selling log garages on the internet and quite often have enticing, appealing looking websites for you to look at. But the question is – what are they really like? The only way to find out is to spend a little time and seeing what it’s like’in the flesh’ so to speak. By doing so you can be sure the new building will suit all your needs and you can be sure of the quality. We have a building display area close to Woking in Surrey and we have many buildings on display for you to view although we don’t have the garage at the moment. By walking in these cabins you will get a feel for the quality and whether they will be right for you. 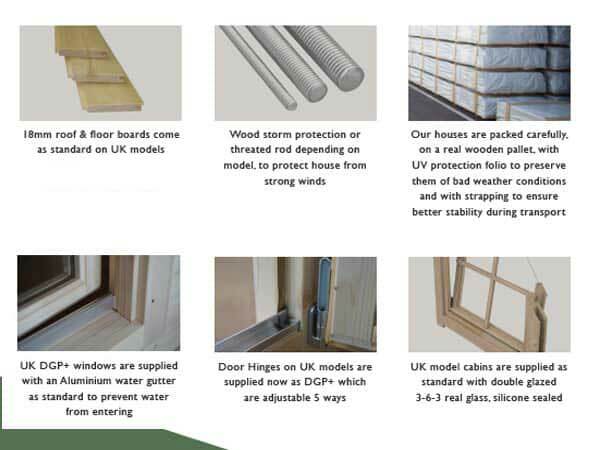 .Our family business background in garden buildings manufacturing started in 1979 BT (before Thatcher) This experience is important to use and also helps to give us the know-how about the quality of materials which should be used. Our Ethos is ‘Make to a Standard – NOT down to a price’. 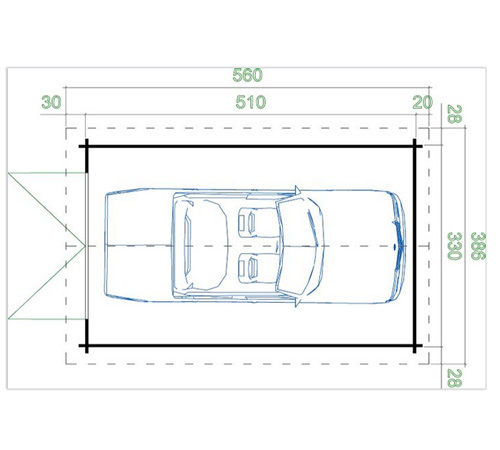 Size: This Mitcham log style garages is 3.3m x 5.1m (11ft x 17ft nominal Floor Size) in size. Apex or gable Style. Note this is the external size of the body of the garage. The lugs extend 100mm on each corner making the overall size (as most other companies quote) 200m larger. We mention this so you know you are comparing ‘eggs with eggs’. Approximate clear internal size will be approx 3.2m x 5.0m. Please check with us if internal size is crucial. Cladding: Standard interlocking logs are 44mm and slot into each other. The log profile has designed wind-tight connections to ensure a superior resistance against wind. Untreated. Kiln dried timber from sustainable sources. Roofs: 18mm thick T&G boards used on the roof sections supported by strong roof beams. Roof beams meet EN 388 stringent standards. Untreated. Supplied with felt tiles (shingles) in either black, red, brown or green or Polyester based felt as standard. 100mm (approx 4in) overhang all round. 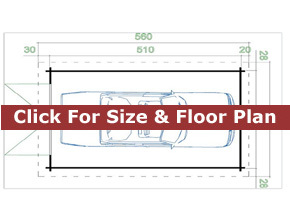 Floors: This garage is designed to sit onto your prepared concrete base. Doors: Joinery quality double garage doors 239cm wide x 202cm high (94in x 79in) – approx size. Supplied untreated. Lower Walls: Height: 211cm (83in) – all Mitcham log garages. Ridge Height: Height. 271cm – on all Mitcham log garage kits. Note these buildings are just over 2.5m meaning these log garages may need planning permission depending on where you locate it. Treatment: All cabins are supplied untreated. Assembly: Log cabin style garage are supplied in kit form for self assembly. Option for assembly through a third party if required. If being built you would require a concrete base. These buildings are assembled by interlocking the panels for ease of taking it down again if you decide to move. Optionally, we have an option for building a base for you. Delivery: All cabins are delivered and HIABed off the lorry for you free of charge throughout central & Southern England. Deliveries to Scotland would cost £150 extra. Deliveries to Cornwall & Devon, South & West Wales and Northern England would cost an extra £60. Our Trentan ‘Mitcham’ log cabin style garage for sale feature superb light and airiness, ensuring that using this garage for your car at your home will enhance your life style. These are immensely versatile garages and will suit all manner of uses which you can share with your family and cars. Superbly designed to fit into most homes effortlessly – this is what good design should do. With many different qualities of log cabins available it’s always wise to view before buying to ensure you are not buying ‘cheap’ and getting ‘cheap’. Visit our display site bear Guildford and judge for yourself how good these Trentan cabins are. You will be very welcome.